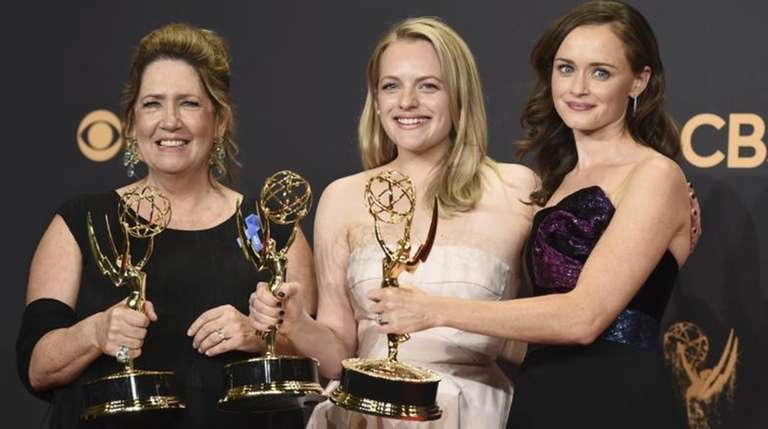 In a historic victory that at least critics (for once) saw coming, Hulu’s “The Handmaid’s Tale” won as best drama Sunday at the 69th primetime Emmy Awards. With a powerful social message, “Tale” also becomes the first streaming series to win the top Emmy award. “Handmaid’s Tale” beat out a field of other acclaimed freshman dramas. A total of five newcomers were nominated this season, the most since 1961 when four freshman series were nominated. Meanwhile, Sterling K. Brown won for outstanding actor in a drama for “This Is Us,” and as he pointed out himself, there was some history in this too: Andre Braugher (“Homicide: Life on the Street”) was the last African-American to win this in 1998. “Veep’s” Julia-Louis Dreyfus won for outstanding actress in a comedy, her sixth in a row (an Emmy record for an actress playing the same character), while the HBO show picked up a third straight win for outstanding comedy series. Louis-Dreyfus is now in rarefied company: a total of eight Emmy wins, or one behind Cloris Leachman. Donald Glover won for outstanding actor in a comedy for “Atlanta,” the FX newcomer that some thought had a decent shot at upsetting “Veep.” He becomes the first African-American to win this since Robert Guillaume in 1985. Glover also won for best director for a comedy. Colbert also showed a tweet from Trump that trashed 2014 Emmys host Seth Meyers: “[he] sounded like he had a mouth full of marbles.” Cut to Meyers in the audience, who then spit out some marbles. That was about as rough as Colbert got on the president, although several trophy winners made critical remarks about Trump in their acceptance speeches. BIG NIGHT FOR ‘SNL.’ Everyone expected “Saturday Night Live”(with a total of 22 nominations, a show record) to have a very good night Sunday, and everyone was right: “SNL” had its best night in 25 years, winning four more trophies (in addition to two announced last week), including outstanding variety sketch series. Show impresario Lorne Michaels, in accepting the award said: “I remember the first time we won this award after our first season in 1976 and thinking as I was standing there alone that this was it — the high point. There’d never be another season as crazy, as unpredictable, as frightening, as exhausting or as exhilarating. Turns out I was wrong.” Sea Cliff native Kate McKinnon won for supporting actress in a comedy, and Massapequa’s Alec Baldwin won for supporting actor in a comedy for his portrayal of President Trump. Said he — in a line that got a reaction about as raucous as you could have imagined: “I should say — at long last — ‘Mr. President here is your Emmy.’” Finally, Don Roy King won for outstanding director of a variety series. SEAN SPICER. THE EMMYS. Those are two names no one ever expected in the same article, much less the same show, but Spicer surprised — no, he really surprised — the audience at the Microsoft Theater and probably a few million viewers, too, when they saw President Trump’s former press secretary and late night TV foil on the awards stage. Spicer rolled out on the stage on a podium-Segway, then Colbert said, “Melissa McCarthy! Everybody give it up . . .” Cue to the gaping mouths in the audience, including McCarthy’s. Funny — and Colbert’s biggest moment of the night. Who would have imagined?